Through the ages, the infinity symbol, a sideways figure eight, has represented eternal development and balance. Also known as the lemniscate, this powerful symbol stands for equilibrium, harmony, and the interconnectedness of all things. Although magical knowledge of symbols has often been kept secret throughout history, today the power of this symbol is available to all. In this accessible, hands-on guide, Barbara Heider-Rauter explores the spiritual world of the infinity symbol in a personal and practical way, allowing each of us to benefit from its positive influence for balance and harmony in ourselves, our relationships, and the wider world. She begins with a short exercise to attune readers to the energy field of the lemniscate. She explains how the infinity symbol offers the perfect response to a system that encourages separation and a world in which the negation of our feelings is often the source of illness and pain. She details simple exercises to reconnect the two halves of the brain, the analytical and the emotional, resulting in harmony and healing. She teaches how to use simple visualisation, physical exercises, and directed drawing of the symbol to achieve practical results in our daily lives. Beautifully illustrated in full color, the book also offers a wealth of information on the appearance of the infinity symbol through the ages in all its forms and contexts, from history and mythology to our own tiny body cells and the natural world. This book urges the reader to establish wholeness, to balance the scales of duality and find harmony. With the power of the lemniscate at hand, decisions will be made with greater ease and relationships filled with harmony and a lighter heart. We live in a society in which we communicate only partly through language; we are often unconsciously influenced by symbols as well – a self-contained world that affects us daily. Our world is generally ruled by symbols, which have much more effect on our subconscious than we could imagine, so it is not surprising that knowledge of the subtle power of symbols was jealously guarded in the past, to be used by the ruling classes and passed on as secret knowledge. Nowadays we are fortunate in that much of the old wisdom has become available to everyone once again, and we all have the chance to use these powerful signs and symbols to assist us on our own path towards a more conscious living -- a positive development both for ourselves and for others. Many recognise the symbols, but very few are aware of their effect upon us. Symbols are used both singly, in isolation, and combined to form logos used in advertising, for business cards and on everyday products. They have just one goal: to exert an influence in a given direction. Master the language of symbols and you will be able to recognise them and understand their meaning. It is up to us to go through life attentively, recognising and interpreting symbols and their messages – then we too can make use of this ‘language’. The more consciously we perceive the hidden power of symbols, the easier we will find it to invoke their magic influence, or to escape it when necessary. This exploration of the infinity symbol is intended to gently guide you and help you open your eyes as you go through life, to attain a better understanding of the message of symbols. We will encounter many symbols that are used positively, and some less so. Every symbol has both capabilities -- the negative is usually found by inverting or reversing the positive symbol. 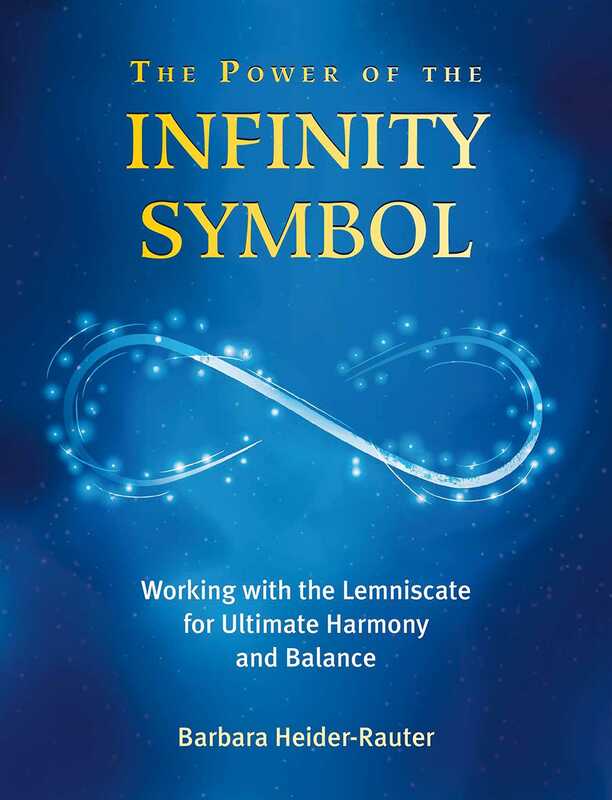 Taking the infinity symbol or lemniscate as a positive example, I hope that this small book will awaken your curiosity and joy in the language of symbols. The lemniscate is one of the few that cannot be reversed or inverted. We will learn to use its amazing balancing power for our own well-being and discover how to do the same with other symbols. The lemniscate can bring great benefits to humans and all living creatures. Simple and perfect, it can be used at any time and in any place. It helps us to find our harmony and to achieve equilibrium on every level. The infinity symbol enables us to strike a balance in the polarities and duality that make up our lives on Earth. We can use it to appreciate and further the eternity of our continual personal development. I would like to pass on my own experiences with this powerful symbol in the pages that follow; I make no claims to absolute knowledge or perfection, I would just like to share with you the simple exercises and insights that have come to me during my many years of leading seminars, in the hope that they will be of use to you. Thanks to our imagination, the infinity symbol is easily visualised, drawn or arranged wherever balance needs to be introduced. Use this powerful symbol for personal benefit and spiritual growth. Use it to approach problems in relationships in a balanced way, to recover the flow of your energy and to restore yourself – to become more balanced and to make decisions more easily. You can achieve all this in a light-hearted way using the infinity symbol. The lemniscate is a symbol of the eternal, but it is also a symbol of duality and all that is polarised here on Earth. It contains within it the ambivalences of the masculine and feminine, of what is above and below, of yin and yang, of within and without. From the moment we are conceived, we experience a polarised world. We experience separation at a very early age, and the distinction between Me and You, as we become aware of things that are ‘Not-Me’. During our years of education as children, we form opinions and learn to distinguish between good and evil, right and wrong. We begin to analyse at an early age, recognising the duality in our everyday lives that exists in many things. We learn to make decisions and to say ‘yes’ and ‘no’ - yes and no belong together, neither possible without the other. When we say yes to something, we know that in so doing, we are deciding in favour of something and yet also against something else. This unity forms a whole, and recognising its holistic nature in turn brings us to our own unity, and a new wholeness and health. The infinity symbol contains within it an opportunity to explore this unity or wholeness, and to initiate wholeness and healing within us. The vibrations of the infinity symbol have a frequency that stimulates this wholeness and helps it to develop - so the more often we investigate these vibrations, the more beneficial it is for the balance of the polarities within us. The lemniscate helps us balance the scales of duality and find harmony. Barbara Heider-Rauter is a qualified educator and therapist with many years’ experience. One of the leading aura-soma experts in the world, she leads meditation evenings, seminars for personal development, and spiritual journeys. For more than 15 years, she has run a specialist spiritual shop in Salzburg, where seekers can meet kindred spirits.